Jet Ski rentals are CLOSED for the Season. Thanks for a great year and see you next Spring! We have brand new Yamaha 110 HP three-seaters! Must be 18 years old with valid drivers license and major credit card. Passengers can be any age. 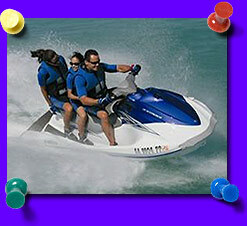 A $500.00 security deposit is required; it is refundable upon return of the jet ski. We supply with instructions, life jackets and gas. We do not take reservations over the phone – it is first come, first serve! We recommend that, if you want to ride, you stop by in the morning that day and set up a time.